Time to wrap up our coverage of an outstanding Summer Hoops Festival. 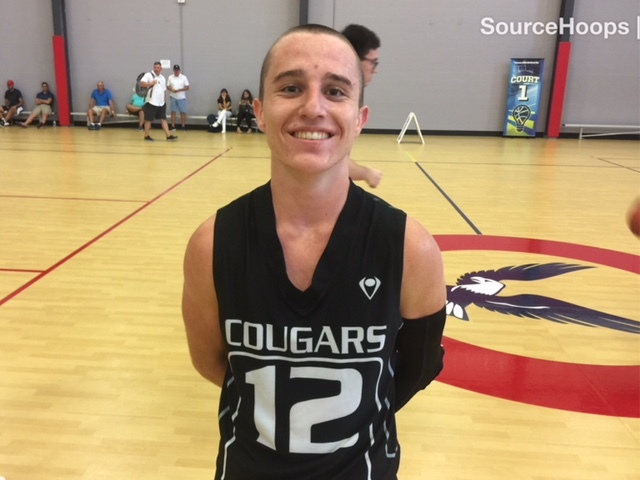 Dallas Graziani, a 5’7 rising junior for the Broward County Cougars, belied his size by scoring 20+ in most of his games. Team Vecchio from Argentina brought four teams to compete. They are staying around the compete in the Super Showcase out at Disney. Rising sophomore Leandro Barbera of Team Vecchio Red, a 5’11 point guard, was near double figures in most games as well given the responsibilities to run the offense. Another member of the 2021 Class, 5’8 guard, Miguel Cartosio, had a team-high 18 points in a contest for Team Vecchio White. Chance Dixon, a 5’11 rising junior out of Santaluces in Lake Worth, had games of 16 and 13 points for the Delray Blazers 16U squad. Incoming 5’7 freshman A.J. Guardino was in double-figures and the leading scorer for DME Summer 16U. DME Summer 17U’s Khari Smith and games of 28 and 14 points. Michael James, a 6’5 wing from Wekiva, had games of 19 and 20 points for Each 1 Teach 1 2021. The 19 point game featured five makes from beyond the arc. Elliot York out of West Orange had games of 18 and 14 points for Florida Xclusive Elite. Chris Cross had a pair of double-figure games (18 and 15 points) for Game Speed Elite 16U. Keenan Blackshear, a 6’6 wing for Game Speed Elite 17U, averaged in the high teens with games of 21, 16, and 18 points. Austin Geller, a 6’3 wing for the Jupiter Jaguars, had a game where high pumped in 27 points, one of the highest totals in the event. Jacquan Lowman, a 6’0 rising sophomore from Apopka, had a pair of games in double figures for Raptors Elite 16U, scoring 12 and 24 points in the outings. Raptors Elite 16U Gauntlet had a pair of double figure scorers in 6’4 Marshaun West of Sanford Seminole and 6’4 Jaylen Williams from Kissimmee Liberty. J.J. Harris of Showtime Ballers 15U was consistently in double figures with games of 14, 17, and 21 points. Jaylen Haynes of the South Florida Kings 16 was the top scorer for his team. The 6’7 forward out of Dillard had a high game of 20 points during the week. Tyler Miller, a wing out of Lake Worth, was high scorer for the South Florida Kings Gauntlet 17U with 21 an outing. Kadeem Wilks, a 6’2 wing from Delray Beach Atlantic, was a consistent double-figure scorer for the South Florida Sharks 17U squad. Antwan Walker, a 6’0 rising junior, a had a game of 18 points with four made threes for Taylored Athletes Polk Elite. Joshua Blazquez, a 5’8 member of the Class of 2021 out of Kissimmee Osceola had games of 12, 17, and 22 points for Team Parsons (CP 25) 15U Select. Both Tyreke McElwain, a 5’9 rising junior from Tally Godby and 6’5 rising senior Chosen Levarity from Tally St. John Paull II averaged double figures for Team TAB. Meshach Maddox, a 6’4 forward out of Lake City Columbia, led Team Talent in scoring with 20 points. Deion Gooden, a 6’0 guard out of Tampa Alonso averaged double figures for the two games Team Tampa played on Saturday. DaQuan Gonzalez, a 5’10 rising sophomore out of Jensen Beach, had a game-high 24 points in one contest for the Treasure Coast Titans. He also had the best hair of the event, hands down. John Latimer, a 5’11 guard for Triple Double Basketball Academy, had games of 24 and 16 points. Kentron Poitier, a 6’5 wing for Triple Threat Basketball, averaged double figures with games 13, 13 and 22 points.